September 2003 update: The cyrillic side of the sculpture's code has been solved! Title: Antipodes. 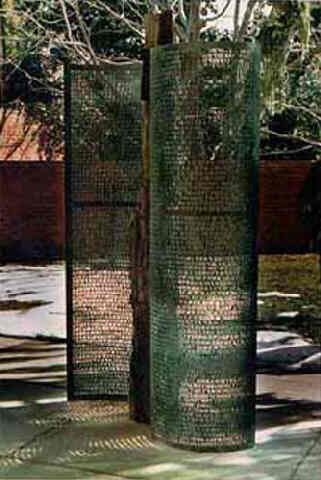 Also may have been known as "Kryptos," "Untitled Kryptos Piece," "Secret Past," or "Covert Balance." Date: Two versions. A 6'-tall version in 1992, and a 9'-tall version in 1997. 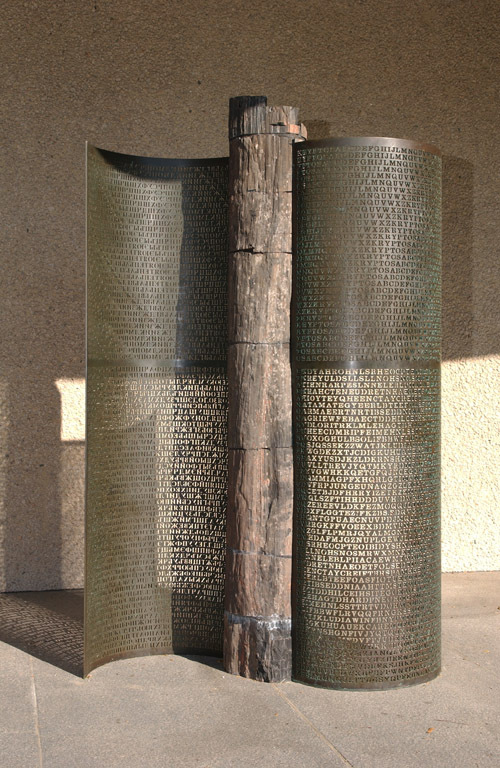 Larger version: Hirshhorn Museum, Washington D.C.
Sanborn's description of "Covert Balance": "This piece was inspired by the Kryptos piece I did at the C.I.A. Headquarters. It depicts two opposing encoded texts, one relating to C.I.A. covert operations and the other to K.G.B. operations. The two text panels are separated by a petrified tree which was burned before petrifaction. Its present location at the Hirshhorn museum on the mall between the U.S. Capitol Building and the Washington Monument seems to be ultimately appropriate." Pictures: Many images of the sculpture are available here. Thanks go to the Hirshhorn museum, Nadine Granoff, and the other anonymous photographers who have contributed these photos. 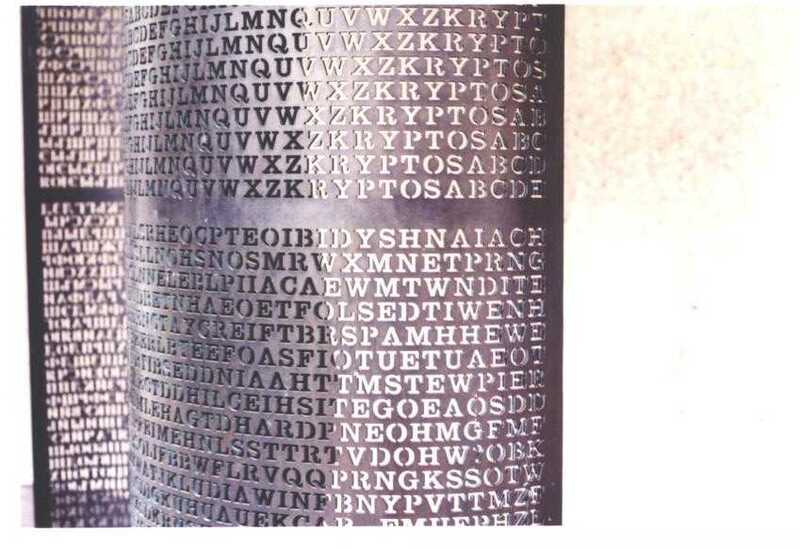 Code Status: The English side of the sculpture appears to repeat over and over the text that is on the Kryptos sculpture at CIA Headquarters. That code is in 4 parts, of which 3 have been solved. Please see the Kryptos page for more details. The Cyrillic side appears to have most of the text from Sanborn's Cyrillic Projector, along with an additional ciphertext section which is not on any of Sanborn's other sculptures. As of September 23, 2003, all of the Cyrillic side has been solved. Please see the Timeline for more details. On Antipodes, the ciphertext starts with part 3 of what is on the CIA version. It then continues through part 4, has a space separator, and starts over with part 1 of Kryptos. It then continues through parts 1, 2, 3, and 4, then does *not* have a space separator, and continues on with part 1 and part 2, but truncates in the middle of part 2 when it gets to the bottom of the sculpture. 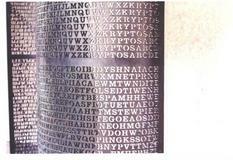 There are two dots in the ciphertext of the Antipodes version, which do not exist anywhere on the Kryptos sculpture. They correspond to the location of the plaintext initials "WW" ("Who knows the exact location? Only WW") in part 2. On Kryptos, there are a few letters which are out of alignment at the beginning of part 3. The Hirshhorn website lists it as: "Partial Gift of Gilbert and Ann Kinney and Joseph H. Hirshhorn Purchase Fund, by Exchange, 1998 (98.22)"
Conflicting stories have been received as to whether there were 1 or 2 versions of this at the Hirshhorn. At this time, only 1 version is at the Hirshhorn, called "Antipodes". Most of the images in the Antipodes Pictures directory are of Antipodes, though some may be of the "other" version of the sculpture. The image at right was found in a catalog of Sanborn's public works, and was clearly labeled as "Covert Balance" and located at the Hirshhorn Museum, though it's obviously in a different location than the current "Antipodes" sculpture. Update: According to Jacqueline Shilkoff of the Neuberger Museum of Art, the image at right is of the 1997 version while it was at the Neuberger Biennial, and the photo is of the Purchase College campus. According to sculptor Jim Sanborn, the story is as follows: In the 1990s, he created a small version of this sculpture, which was purchased by a private collector, Gilbert Kinney. The collector displayed it on his terrace for a time, and then when he moved, he donated the piece to the Hirshhorn. Another museum, the Neuberger, commissioned a larger version of the piece for a gallery show. Sanborn accordingly created the larger version, and then after the Neuberger show, Sanborn traded the larger version to the Hirshhorn in return for the smaller version, which was then sold to another collector in California via the "L.A. Louver" gallery. Another image from an alternate location, this piece is listed as 'Kryptos' on the ArtNet website by the Numark Gallery, but is probably one of the two Antipodes versions. More info is in the Artnet listing. 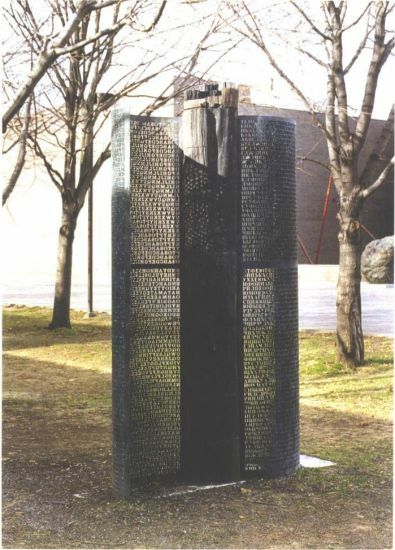 9/19/2003: Posted sculptor Jim Sanborn's description of the history of the two versions of this piece. 9/14/2003: Added more information trying to clarify the differences, if any, between different versions of this sculpture.